In this blog, Ioannis D Gallos, Argyro Papadopoulou, Myfanwy Williams and Joshua Vogel, authors of the Cochrane network meta-analysis on uterotonic drugs, look at which drug is most effective and safe in preventing postpartum haemorrhage. Postpartum haemorrhage (excessive bleeding after birth) is the most common reason why mothers die in childbirth worldwide. Although most women will have some bleeding at birth, others may bleed excessively, and this can pose a serious risk to their health and life. How can we prevent postpartum haemorrhage? To reduce postpartum haemorrhage, the routine administration of a drug to contract the uterus (uterotonic) has become standard practice across the world. Currently, oxytocin is recommended as the standard drug to reduce excessive bleeding. Multiple other uterotonics have been evaluated including carbetocin, misoprostol, injectable prostaglandins (sulprostone, carboprost), ergometrine and combinations of these (oxytocin plus ergometrine, or oxytocin plus misoprostol), each with a different effectiveness and safety profile. How can we decide which drug is best? Over the last four decades, evidence from hundreds of randomised trials has accumulated comparing one uterotonic drug to another trying to find out which one is best. There are also several Cochrane reviews summarising the evidence from trials that directly compared one uterotonic drug against another or placebo in head-to-head trials. However, existing Cochrane Reviews are conducted by different groups, with different protocols and at different time points. With such a large number of possible comparisons it is difficult to say with confidence which uterotonic (if any) is best. When multiple drugs are available, a network meta-analysis is better placed for synthesising and interpreting the wider picture of the evidence and to be able to compare all drugs in one single coherent analysis. Apart from putting all the evidence in one place, network meta-analysis makes a much more efficient use of the available evidence compared with conventional pairwise meta-analysis, as it uses network evidence by combining both direct and indirect evidence. Indirect evidence is provided through the exploitation of a common comparator. 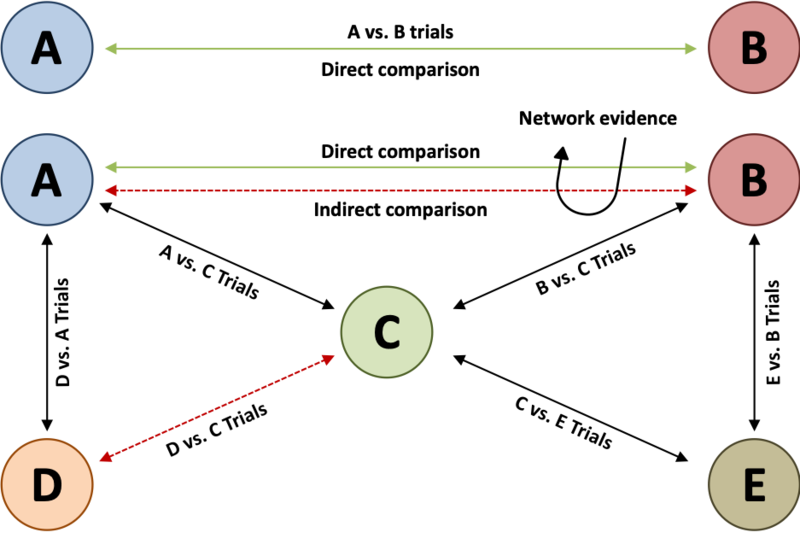 If drug A has been compared to drug B and drug B has been compared to drug C, then we can infer about how drug A compares to drug C indirectly (Figure 1). This is particularly important if you have even more drugs (drugs D and E) as the number of possible comparisons increases exponentially. With large numbers of trials and comparisons, indirect evidence is able to improve the certainty of our inferences when comparing all drugs. Figure 1 How the network evidence is generated in a network meta-analysis. What did we find through the network meta-analysis? In December 2018, we published the update of the Cochrane network meta-analysis comparing the uterotonic agents for preventing postpartum haemorrhage. This network meta-analysis included 196 randomised trials, involving 135,559 women from 53 low-, middle- and high-income countries across the world. In most studies women were giving birth vaginally and in a hospital. Our findings suggest that all drugs are probably effective for preventing excessive blood loss after childbirth when compared with no routine uterotonic drug. Ergometrine plus oxytocin combination, carbetocin, and misoprostol plus oxytocin combination may have some additional benefits compared with the current standard oxytocin. The two combination drugs, however, are associated with significant side effects compared with oxytocin. Women who may otherwise have continued with an uncomplicated birth might find these disturbing. Carbetocin may have some additional benefits compared with oxytocin and appears to be without an increase in side effects. What has been the impact of this evidence? Following the publication of this network meta-analysis, the World Health Organization (WHO) has now updated its 2012 guidance on the prevention of postpartum haemorrhage with four new recommendations on seven uterotonics. The newly updated recommendations aim to improve the quality of care and health outcomes for women giving birth. In light of the updated WHO guidance, international agencies and donors, as well as professional associations, clinicians and national health systems stakeholders, will re-assess their national health policies and protocols on PPH prevention. We are committed to updating our network when new evidence emerges and incorporate all available data as a “living network meta-analysis”. This being in line with the innovative “living guideline” approach developed by the Department of Reproductive Health and Research at WHO, whereby literature surveillance and systematic prioritization guides the updating of selected high-priority recommendations on a continuous basis. Join in the conversation on Twitter with @CochranePCG @CochraneUK or leave a comment on the blog. 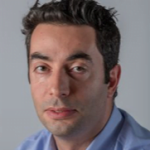 Ioannis D Gallos (IDG): is a co‐applicant to the UK National Institute for Health Research HTA Project Award 14/139/17 entitled Uterotonic agents for preventing postpartum haemorrhage: a network meta‐analysis and cost‐effectiveness analysis. He has been involved in one or more previous or ongoing trials related to the use of uterotonics for the prevention of PPH that were eligible for inclusion in this review. Ferring Pharmaceuticals and Novartis supplied carbetocin and oxytocin for these studies. IDG did not participate in any decisions regarding these trials (i.e. assessment for inclusion/exclusion, trial quality, data extraction) for the purposes of this review (and will not for future updates) – these tasks were carried out by other members of the team who were not directly involved in the trials. Argyro Papadopoulou (AP): none known. Myfanwy Williams (MJW): is employed by the University of Liverpool as a Research Associate at Cochrane Pregnancy and Childbirth. Her role is supported by the World Health Organization. Joshua Vogel (JPV): led the updating of WHO recommendations on uterotonics for the prevention of postpartum haemorrhage based on this review.